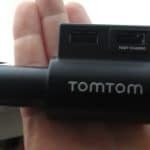 TomTom Sat Nav Reviews – TomTom Go 5000 - Which Sat Nav? The Go 5000 is TomTom’s premium offering in their satellite navigation products. In case you were wondering the TomTom Go 6000 is exactly the same unit, the only difference being the screen size. The Go 5000 has a 5″ screen whilst the 6000 has a 6″ screen. Oh, and there’s also a difference in price of around £50. As with my other reviews, I hope this one will provide you with an overview of the device and I will share what I liked and what I didn’t likes with you all. The design of the unit is exactly the same as it’s little brother – the Go 50. It’s rectangular shape, rounded edges and grey trim are somewhat lacking in creativity. This device is part of the Premium Range and as such in my view, it should have a premium ‘look and feel’ to go with it. However, despite the design being somewhat conservative it wouldn’t look out of place used in any type of vehicle. The case of the device this time is different to some of the earlier TomTom models. The Go 930 for example had a rubberised surround that made it quite robust. The newer ranges from TomTom have a plastic rear. In truth, this probably won’t be a problem for most people as their devices will stay in the car. However, it is worthy of note if you are planning to walk around with your sat nav. You should also be rather more careful with it when leaving the car and throwing it into the bottom of your bag. As mentioned earlier there are two screen sizes available at this level. This model has the 5 inch screen whilst the Go 6000 has a 6inch screen. Like most of the options available on sat nav systems this really does come down to personal preference. In my view, the 5inch screen is ample and it’s a little difficult to justify the additional cost for the larger screen. Having travelled across the UK a couple of times on the way to France, I can happily report that I have not had any issues in getting to my destination. The software searches for the address quickly and provides the fastest route in a matter of a seconds. The pinch and zoom system works well and is an useful addition if like me you like to browse around your location via the map. As my running gps watch doesn’t have mapping facilities, I use this feature when searching for an area to run. It’s an useful feature for finding those little green areas on the map particularly, when you are not familiar with your surroundings. One issue that I did find however, was that it showed my destination on the wrong side of the road. This has only happened on a couple of occasions, neither of which caused me too much hassle so it can’t be described as a deal breaker. The first time this happened was when I was looking for an address in the Staffordshire area. It was a fairly rural area and therefore not a big deal, but the property did show up on the ‘wrong’ side of the road. So in fairness, almost top marks for getting you to your destination. This particular model is always connected as it has an in-built sim card. That means that without any additional cost you get the traffic updates. Traffic updates are available on the cheaper models in the Go Range however, they do require a smartphone to access the information. Depending upon your mobile data package and your location this could turn out to be an expensive exercise. Thankfully, this does not come into consideration with the Go 5000. This is the area where i believe that TomTom come into their own. Their Traffic warnings and updates are an accurate portrait of the situation ahead of you on the road. When there’s problems ahead your route will change colour – red means that there is a rather big traffic delay ahead. The information is given cleanly and you can see how it will affect your arrival time, if you decide to ignore it and stay on the original route. If I knew where I was and had experience of a particular traffic jam (it might be part of your daily commute) I may sit tight and see it through. However, the clever part is that you do have the option to avoid the traffic jam and to change your route. I did however, feel frustrated at times on my commute home. The area where I currently live is notorious for traffic jams, particularly around rush hour. This is largely due to the inadequacies of the public transport system, that leaves most people with no option but, to drive to work in the morning. Without digressing too much I would be guaranteed to hit heavy traffic around 6 p.m. The sat nav would show me the jam ahead but it would also show all the traffic jams on the other possible routes home. Now all this achieved was put a dark cloud over me as I realised there was no hope – I was stuck in traffic no matter what route the sat nav provided. In other words, the sat nav showed how congested the roads were in the city at that time – a rather depressing and bleak picture for someone just trying to get home! Not the fault of the device, which simply deals in facts but it sure didn’t make me feel any better knowing how bad the roads were! Upon the initial release of this device there was no way of recalculating your route if you ran into an obstruction. Thankfully however, TomTom do appear to be listening to their customers on their forums. They have sensibly reintroduced the ‘find alternative route’ through a recent update. 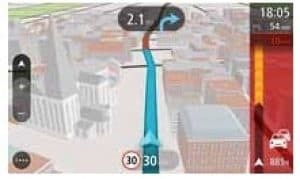 This is such a powerful feature of a sat nav as it allows you to change your initial route depending on what issues lie ahead. The mounting system for the Go 5000 differs slightly from the GO 40/50/60. The Click & Mount system it utilises sees the introduction of a cradle within which the device sits into. The cradle is attached to the windscreen in the same way as the other models. The suction cup is put against the glass and you then have to turn the disk to the locking position. This creates more suction to secure the cradle and therefore the device locks in place. As usual with my reviews I add this section to try and help you get the most out of your device. These tips are a result of me playing around with the settings and giving the device a proper trial during my frequent road trips. There is no doubt that this is a fine navigational device. It does what it says it does rather well. The big question though is whether or not it’s worth the money? Hmm, well I suppose it depends on you. If you are someone who likes a premium product and doesn’t mind paying a bit extra then, it may be for you. The Traffic updates would undoubtedly be worthwhile if you regularly travel long distances. However, some local knowledge of your surroundings and using those hidden rat runs can see you beat the sat nav on your route home. If however, you are more like me and prefer to mind the pennies and tend to travel the same route everyday, the additional expense becomes harder to justify. A cheaper sat nav like the TomTom Go 50 may well be sufficient for your needs. Do bear in mind though that you will require a smartphone with all of the cheaper models in the Go Range. A Premium product that does it's job of getting you to your destination without fuss. Lifetime Maps & Traffic is a welcome addition as is the more responsive capacitive screen. The negatives are the expense and the need for a memory card in order to receive future map updates. 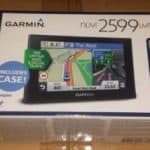 Garmin nuvi 2599 Review - is it as good as TomTom? It’s great how you did your structure as it gives all the important information to readers and he feels like to have more information and facts after reading it. At the moment, I don’t need a navigation system because I have one implemented in my car but for travelling abroad it would be helpful. What kind of system would recommend when I travel around in Argentina and Brazil? Wow, I didn’t know that there is a gps system that offer 3D map. Cool. My husband used Garmin before (I hope I spelled it correctly). It has just a basic feature and we used it in our road trips across USA. Btw I have a question regarding this model. You said it is always connected to get the updated traffic. Does it mean you need to pay for the data usage? I’ve been looking into a decent new satnav over the last few months but now there’s so much choice it’s near enough impossible to hone in on one. I was using my smartphone but you know how bad nav on that can be ( always warn you after you miss a junction! ). This looks like a top choice – I’ll be looking into this product further! Hello Dylan Coming to your website maybe was a hint for me to get a navigator, I don’t have one because I am stubborn, I tell myself I won’t get lost. The other thing is, if i am told to go left I go right, that happens 80% of the time. Go figure! I enjoyed going through your pages, I like the way you set it up and how you made it easy for the ones that want to buy one make a good choice. Keep up the great work. This one is a lot better device than the last one reviewed. I see also that you don’t need a smart phone to update it or connect to the additional services. Cost may be a consideration for some, but sometimes its worth the extra money because you will get what you pay for. I really like the added traffic alert feature on this device!! I often travel into and out of larger cities and this would be a great tool for those trips! You said this device was a little pricey though. I would be interested to learn about others that offer the same features but might be less expensive. Are you aware of any other GPS devices with this traffic alert feature as well? I really enjoyed reading through this review. You format your posts great, and it makes it really easy and enjoyable to read. 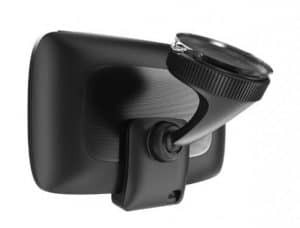 I think this is a great product, with a nice, large screen, which is great for when driving. Cheers for the fantastic review, and keep on keepin on. Pretty cool review. Loved the graph at the end of the article. Gave the review a professional feel to it. Anyway enough on the layout side of things. I am surprised that people are still buying GPS units like TomTom when smartphones have it all through Google Maps, Nokia Here, etc. I travelled around the USA NWest last August and only needed to use my Samsung Galaxy Note 3 with a travel SIM in it and I was fine. Longer battery life than the TOmTom has. What do you think? Are sat navs still viable these days?